My work with herbal medicine began with a calling to be in direct healing relationships with people. A longing to commune with nature coupled with a curiosity about health naturally lead me to plant medicine. 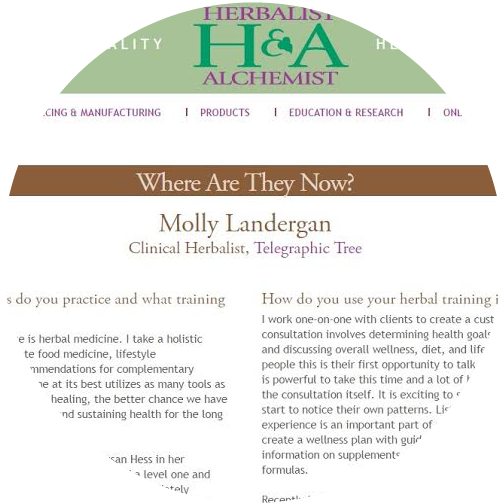 a clinical herbalist and artist living in Philadelphia, PA. I grew up in the mountains of Virginia but have made my home in West Philadelphia since 2004. I received my undergraduate degree in sociology from James Madison University and completed post baccalaureate work at the University of Pennsylvania where I studied photography, video and printmaking. These disciplines, the combination of science and art, proved foundational to my work as an herbalist. My formal herbal medicine training began with Susan Hess at Farm at Coventry. It was through her classes that I became anchored on my path as an herbalist. In 2014, I completed a two year extensive training course in clinical herbalism at David Winston's Center for Herbal Studies. I spent an additional year in 2015 studying with David Winston in his Therapeutics program. Within my own healing journey, I have taken an integrative approach by weaving together a variety of complementary modalities including herbal medicine, acupuncture, meditation, Western medicine, yoga, energy work, tarot, astrology and nature based spiritual practices. This work has expanded my perspective on health and reinforced my belief that medicine at its very best works holistically.